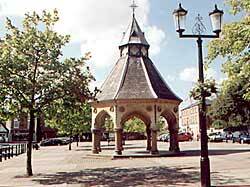 The Butter Cross in Bingham marketplace, erected in 1861. (A. Nicholson, 2000). ALL the world and Bingham is a phrase that has long passed current in Nottinghamshire. Its origin is perhaps somewhat obscure; but the legend is accounted for in one way by a notice-board once posted on an ancient hostelry at Newark, which was a great centre for carriers, bearing the words, Passengers and parcels conveyed to all parts of the worldand to Bingham. This innocently-intended announcement seems to convey a covert innuendo that Bingham is one of the lone places of creation. The insinuation is by no means borne out by fact, for two lines of railway intersect it, and it lies but a short distance off the Foss-road between Nottingham and Newark. Bingham is a substantially-built little town, and has a history which goes back to very early times. Extensive grants of land in this neighbourhood were made by William the Conqueror to one of his powerful followers, Roger de Builli, and amongst the possessions of the latter was Bingham. This estate passed from him to William Paganel, and through the hands of several other owners, till it was given by Henry III. to Ralph Bugge, one of whose descendants took the name of his demesne, as was usual in those days, and was known as Richard de Bingham. In 1284 he was patron of the living, and was knighted for his services to the State. He appears to have made Bingham his principal place of residence, and was one of the conservators of the peace. Other offices which he held were those of justice at the gaol delivery and verderer. In 1298 he attended the Parliament held at York as Knight of the Shire for the county of Nottingham, and after holding several important military positions, he became Sheriff of Nottinghamshire and Derbyshire, in both of which counties he had lands. 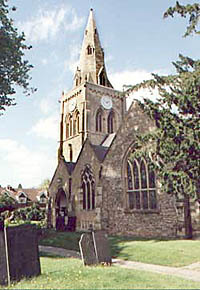 All Saints church, Bingham (A. Nicholson, 2000). Amid the many State duties which he performed, he did not forget his religious obligations, for in 1303 he endowed a chaplaincy for the Chapel of St. Elen at Bingham, which appears to have been his last public action at the termination of an energetic career. In the time of his grandson Richard, the existing Church of St. Mary and All Saints commenced to rise. The structure is a capacious one, and a Decorated spire springs from its massive Early English tower. Two more generations of the Bingham family passed away, and the property next came into the hands of Sir Thomas Rempston. There was, however, a branch of the Binghams surviving at Car Colston, and from it came Sir Richard Bingham, one of his Majestys judges from 1447 to 1470, who was contemporary with chief justice Sir John Markham, another Nottinghamshire worthy. Rempston is the name of a village in the county where the family who acquired Bingham had long been seated. Having landed with Henry, Earl of Hereford, at Ravenspur, Sir Thomas Rempston was made Constable of the Tower, and an Admiral of the Fleet when his master gained the throne. The Order of the Garter was conferred upon him, and he was entrusted with many diplomatic missions. His death was untimely, for he was drowned through the upsetting of a boat in the Thames in 1406. On the recovery of the body it was conveyed to Bingham, and there buried in the chancel. The next Sir Thomas, son of this distinguished man, was present on the field of Agincourt, and otherwise rendered valiant service in the French wars of those days. He also found his tomb at Bingham, and having no male heirs, his lands were divided among his daughters, of whom the second, Isabel, married Sir Brian Stapleton, and carried Bingham as her portion into that family, from whom it passed, by purchase, to Sir Thomas Stanhope. Reference has been made to the Chapel of St. Elen, and it is believed that this was one of the three chapels which stood in various parts of the town. St. Elens probably occupied the site of the old windmills to the west, where a stone coffin and human remains have been found. Chapel Yard suggests the locality of another sacred shrine, and a third may have been in Crow Close, where some old foundations give authority for the surmise. In Dugdales Valuation mention is made of a guild or chantry, which was rated at £4 11s., and may have been where the present rectory-house stands, for the kitchen bears evidence of age. The church is the only ancient building remaining, and has been most carefully restored. Its interior presents a very subdued appearance, the beautiful stained-glass windows imparting a striking and solemn effect. The chancel of the church was restored in 1846 by the Rev. R. Miles, and in 1873 the roof underwent restoration, a clerestory was added, and a chantry chapel built. The effigy of a knight in armour lies in the chantry chapel, and there are portions of another stone figure which has met with hard usage in times past. From the entries in the parish register, which commences in 1508, it is evident that the plague claimed many victims at Bingham in 1646, and these were buried in a yard to the west of the town. Bingham was the scene of an extraordinary attempt at incendiarism in 1710. Outbreaks of fire were discovered in three different places, and an apothecary named Peatfield, who was suffering from religious mania, was tried at the assizes for the offence. In consequence of his insanity he was remanded to prison, and subsequently accommodation was provided for him in two rooms built in the middle of the market-place, where for thirty years he remained, until his death in 1739 after which the place of his detention was demolished. Among the notable clergymen once Rectors of Bingham are Wren, who became Bishop of Ely; Hanmer, who was Bishop of Bangor; and Robert Abbott, brother of one of the Archbishops of Canterbury. Abbott was promoted to be a royal chaplain by James I., and afterwards was Professor of Divinity at Oxford. Mr. Thomas White, a mathematician and author of the Celestial Atlas, is mentioned by Throsby as having been buried on the south side of the church, and the same writer speaks of Thomas Groves, who rose from being a private to the rank of Colonel in the army, and died at Newark in 1790. Coming to later times, Viscount Sherbrooke, famous as Mr. Robert Lowe, was born at the rectory house at Bingham; and the son of another Rector is Mr. Frank Miles, the well-known artist.